The Chair of the Board of Governors of the Federal Reserve System is the head of the central banking system of the United States. The job is known as "Chair of the Fed" or "Fed Chair". The chair is in charge of the Board of Governors of the Federal Reserve System. The chair is chosen by the President of the United States from among the members of the Board of Governors; and serves for four-year-terms after appointment. A chair may be appointed for many terms. William Martin was the longest serving chair, holding the position from 1951 to 1970. 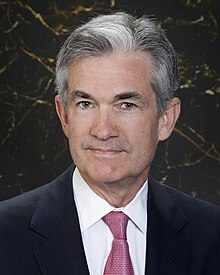 The current chair is Jerome Powell upon taking office on February 5, 2018. ↑ "Federal Reserve Chair Janet Yellen Makes Less Than 113 Other Staffers At The Fed". The Huffington Post. December 16, 2014. Retrieved April 24, 2015. This page was last changed on 30 March 2018, at 23:46.